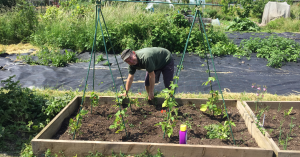 We grow vegetables on two, large community plots at the Moulsecoomb allotments, just off of Natal Road. 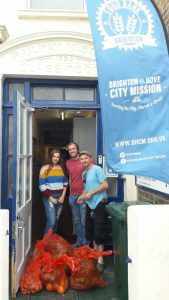 We are looking for volunteers to help us to grow food to donate to the Brighton Unemployed Centre Families Project and the Brighton & Hove City Mission food bank. Volunteers will learn allotment food growing skills and be part of a friendly and supportive group. We welcome adults (over 18s only) who are open to learning basic food growing skills within a friendly team environment. No previous experience of gardening is required. Tasks will be tailored to physical abilities taking note of any health considerations. 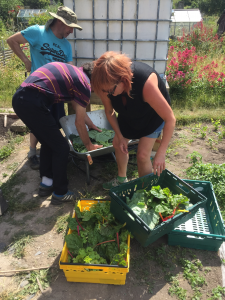 Our allotment group operates on Wednesdays and Fridays from 10am-3pm. You can come to the morning session from 10am-12pm, or the afternoon session from 12pm-3pm, or stay all day. The allotment gates are locked, so volunteers meet at the gates at 10am for the morning session or 12pm for the afternoon session. Please contact us beforehand if you are planning to come along, so that we know to expect you. The Mouslecoomb allotments are located at the top of Natal Road, behind Mithras House on Lewes Road. Lewes Road is well-served by buses. Please note that the allotment entrance on Natal Road is located up quite a steep hill. There is some parking within the allotments site and there is room for 1 or 2 cars directly next to our plot. However, parking in the roads outside of the allotment site is not metered and there are always parking spaces close-by. – Suitable sturdy footwear for gardening and digging (no open toed shoes). – Food and drinks for personal consumption (including lunch). Although we strive to be all-inclusive in our volunteer recruitment, please note that volunteers will need a reasonable level of fitness and physical mobility as the plot is located on quite a large allotment plot with uneven ground. Unfortunately we are not set-up for wheelchair access. We have installed a camping-style toilet in a shed at an allotment shed, but bear in mind that facilities are simple. There is a fresh water tap on our allotment for drinking water and hand washing.